One of the things I always strive to find for this blog are ways that you can help the world without spending a fortune - or sometimes anything at all. I figure you're more likely to take action if it's free. In keeping with that thinking, I present to you today's organization, Good Donor. 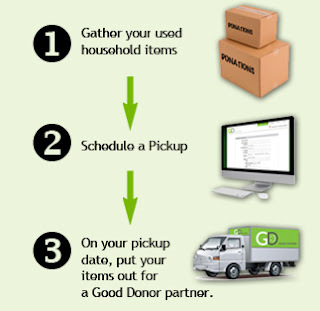 Good Donor is the newest and most convenient way to donate your unwanted household items to charity. It’s a fast, easy, and fun way to give back to charities in your community without having to make a cash donation. Go to the website and when you enter your zip code, you'll get a list of acceptable donation items. 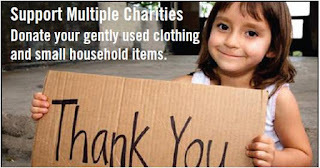 You check off what you want to donate, choose the charity you want to donate your items to, and schedule a free pickup! (Free for you, the organizations receiving the donations will pay GoodDonor a fee for this, but not you). The day of your scheduled pickup, put the items outside and they'll come pick them up and leave a receipt for your taxes. I don't know exactly how this works in an apartment building in the city, yet - though it sounds is if it depends on who's picking up your stuff - but if someone has tried it and can comment, please let us know! A note: Good Donor does not do any vetting of the charities that accept donations, so if you have any questions, ask the googles. Or send me a message and I can help you do some research! Good Donor is a free and easy way to de-clutter your life while helping someone in need. And it's a greener way to avoid adding to our already overflowing landfills than just throwing stuff away!